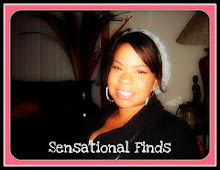 Sensational Finds: Debating: T.V. or No T.V. Debating: T.V. or No T.V. I know that children and television is a very debatable topic. I personally love watching t.v, and have since I was a kid. When I was young I can remember having the tiniest t.v and laying around it with my sisters. In our house growing up you could only watch family friendly t.v shows, so 90210 wasn't allowed. This is why the mini black and white t.v would come in handy. When I was 10 my mom passed away, and with her went the rules she had set. My sisters and I each got t.v. 's for our rooms and we were addicted from there. With all the raunchy reality t.v that's on, I'm nervous for B. I'm not against t.v watching, everything in moderation is OK. Right now at 6 months old Baby B watches Handy-Manny and Baby Einstein in the morning while he has his first bottle. It's become part of our schedule, and I really enjoy watching him stare intensely at the screen. It only last about a half hour, then he gets distracted and wants to play. I personally always have the t.v. on, more for background noise, but I'm struggling with turning it off. I would much rather have B listening to music, then the television. I know as he gets older he's going to want to watch more t.v., and I'm fine with that. As long as it doesn't consume his day. I plan on having a set amount of time each day that he can watch a show or movie. I hate when parents use t.v. as a babysitter, because they don't want to play with their child. That's so sad to me. A child should have human interaction, and not have to rely on the t.v as a playmate. I totally understand that there might be a time that I have to stick B in front of a movie so I can get something done, but that's not going to happen everyday. Parents that use the t.v. as a babysitter I feel, need to re-evaluate themselves as parents. They need to dedicate more time to their kids and help build their developmental skills. They should be the ones teaching their child colors and not the Disney Channel. Like I said I watched a ton of t.v after the age of 10, but up until that I played all day for the most part, and watched T.G.I.F on Friday nights with my mom and dad. It was something special that we always did together and I'll remember that forever. I hope to do the same with Baby B. What are your thoughts on kids and t.v.? I would love to hear your opinion! Labels: beauty, boy, debate, family, fashion, mommy, parenting, stay at home, t.v.